Western Force have rained on Will Genia's parade, claiming their first win in Brisbane as the Queensland Reds and Wallabies half-back returned to action after six months on the sidelines with a knee injury. Genia played the first half before he was replaced by Nick Frisby, as had been planned by the Reds coaching staff, and he looked sharp after his absence. The half-back also showed he had lost none of his trademark pace as he almost ran down Alfi Mafi as the Force winger scored his fourth try of the season. But Genia's direct opponent, Alby Mathewson, was the man of the match, the architect of Mafi's try and of the victory; the Force half-back made a break from a first-phase lineout move before feeding Mafi to beat Genia's cover defence in the left corner. He was also key to the Force's best attacking moment of the second half, making another scything break and launching a kick into space for Junior Rasolea to chase, but the winger, a second-half replacement for Mafi, spilled the ball in beating the cover defence as he touched down. If the Reds were fortunate to survive that raid, their defence was magnificent to deny the Force minutes later when the visitors were camped inside the Queensland 22, Queensland had opportunity to claim maximum benefit from their efforts when they had a five-metre scrum six minutes from full-time, but this time the Force held firm and cleared their lines to preserve their seven-point advantage after Liam Gill and Jake Schatz were penalised jointly for a knock-on. Quade Cooper kicked four of five penalty goals for the Reds, while Sias Ebersohn landed a conversion and four of five penalty goals for the visitors. "We got what we deserved," Reds captain Genia said. "It's nice to come back and be playing, but it's not about me; it's about the team. We're bitterly disappointed with that performance: too many errors, too many silly mistakes like running into touch. It's not acceptable. Very poor." Genia's halves partner, Cooper, was guilty of many of the wayward passes, and he was fortunate not to give up a charge-down try to Chris Alcock in the first half; only the blistering pace of Chris Feauai-Sautia saved Cooper's day. Genia said the Reds were aware of their shortcomings this season. "There is frustration," the Wallabies half-back said. "We feel like we're just struggling to find a bit of rhythm in our game and attack and if you look at specifically this game it's just the breakdown. They were able to get in there and slow us down at crucial times." Not since the Perth franchise smashed Queensland 45-19 almost a year ago to the day, had the Force delivered a better 80-minute team performance; they were hungrier in defence and more accurate in attack than the Reds, and Queensland-raised forwards Hugh McMeniman, Angus Cotterell and Richard Brown each played a key role. 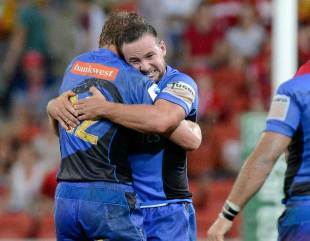 Force captain Pek Cowan was all smiles after his side had claimed its first win of the season. "We took a lot out of our Bulls game, and we had two weeks to prepare for this game. We capitalised on every opportunity we had tonight. I'm very pleased." Cowan said the team had overcome interrupted momentum due to the bye after their efforts against the Bulls in Pretoria because "the break gave us the opportunity to break down the Reds' play and attack where we saw weaknesses." Force coach Michael Foley had endured an 11-match personal losing streak dating back to last year with New South Wales Waratahs, but he was quick to deflect all the praise and attention on to the character, unity and work ethic of his players. "I think we're developing a very strong belief in each other," Foley said. "I think (the win) is great reward for hard work." Queensland's forward stocks were stretched following a head knock and gash to lock Rob Simmons, but Reds coaching boss Ewen McKenzie offered no excuses. "[The Force] played well, you have to give them credit," McKenzie said. "They were desperate and determined and through our own errors we didn't match them, so it was disappointing from that sense."